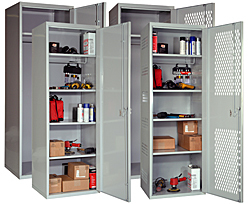 Ideal where heavy-duty strength and versatile storage are needed for sports equipment, work gear, tools, uniforms and clothing. Extra heavy-duty three-point locking mechanism with lock rods that engage the locker frame at the top and bottom of the door while a cam engages the door jamb near the handle location. The fixed hat shelf is welded-in, as is the 3/8" diameter coat rod. Additional shelves may be purchased to provide extra versatility and usability. Ships fully assembled.